One of the most celebrated amateur golfers in the nation, “Dr. 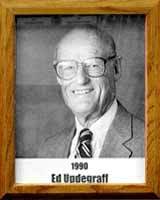 Ed” was city champion 12 times and the first four-time winner of the Arizona Amateur. He won the Southwestern Amateur three times, the Western Amateur twice, played in six Masters, qualified for 12 U.S. Amateur Championships and won the USGA Senior Amateur. He made the U.S. Walker Cup team three times for matches against the United Kingdom. He captained the 1975 Walker Cup team that included Jerry Pate, Curtis Strange, Craig Stadler and Jay Haas. Tucson Country Club, where he won the club championship 27 times, renamed the award the Updegraff Cup. He is called the ‘quintessential amateur golfer” and a man “who left a trail of friendships” by golfers from the United States Golf Association.